HENRY GOLDENBOY LVR 22LR - Corlane Sporting Goods Ltd. 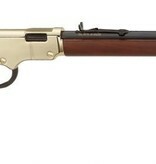 When you think of a Henry .22 caliber lever action the image you conjure up in your mind is the Henry Golden Boy! This firearm is a fixture ingrained into the very fabric of the American culture. The Golden Boy is a lightweight fully functional replica of lever action rifles commonly found on the American frontier. It features sharp looking Brasslite receiver, an American walnut stock, and an exceptionally smooth crisp action. This is a serious hunting rifle for the serious small game hunter. The long 20" blued barrel is perfect for long range target shooting or hunting. It has an adjustable Semi-Buckhorn rear sight with a white diamond insert and a brass bead front sight for precision shot placement.